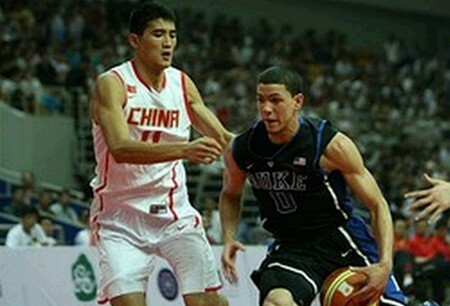 I've been aching to see how the number 1 ranked guard of the High School class of 2011, Austin Rivers, will blend in the playing system of the Duke University Blue Devils. That's why when I heard that Duke will have a tune-up game against the Jr. National Basketball Team of China, I immediately searched for some videos of it in YouTube. Luckily, I was able to find some its videos. In the videos below, I noticed that the Duke uniform looks good on Austin Rivers. And then when he made that nice lay-up in the beginning of the first video I can say that he is comfortable to be part of the Blue Devil Team. He is also blending well with Stephen Curry's younger brother, Seth Curry. They are a nice looking back-court duo and what's nice is that Austin adds athleticism to Duke's back-court. At 6'4 Austin is a monster. Together they demolished China via 93-78. Just check out the videos below from YouTube.